Nassau County students are outpacing their peers nationwide in math and reading. Here’s why. In the spring of 2013, school districts throughout Long Island were making sizable investments in classroom technology. After hearing about the growth neighboring districts have achieved through new instructional strategies and tools, Dr. Nicholas Stirling, Superintendent of Valley Stream Union Free School District 30 looked for “a resource that would support 21st century learning and accelerate the integration of technology into the curriculum.” Dr. Sterling and his leadership team sought to learn from the successful initiatives in nearby districts to implement an innovative plan of their own. Before placing technology in students’ hands, the administration at Valley Stream 30 wanted to ensure that the devices could support teachers in differentiating instruction. They needed a way to use the district’s iPads to deliver personalized content and allow students to engage with a curriculum at their unique learning level. Assistant Superintendent of Curriculum and Instruction Dr. Roxanne France saw “a strong need to provide differentiated instruction that addressed students’ intervention as well as enrichment needs.” After considerable research, administrators noticed that many of the successful programs in surrounding districts possessed a common factor: a partnership with eSpark Learning. Eager to test out eSpark’s data- and engagement-driven approach to differentiated learning, administrators at Valley Stream made a plan to launch 200 second grade students on eSpark’s differentiated math content. To set a benchmark for student growth and inform instruction, Valley Stream 30 administered the NWEA MAP at the start of the 2013-2014 school year. The team at eSpark Learning used data from this assessment to diagnose student needs and provide each student with personalized learning pathways. In this video, explore how eSpark differentiates instruction to accommodate the diversity of academic needs found in most classrooms. Valley Stream quickly immersed themselves in eSpark’s personalized selections of apps, activites, and videos. Teachers also loved the program, commenting that it’s a “great way to motivate kids and teach to their individual needs.” To build teacher buy-in and fully support this important instructional shift, the team at eSpark Learning provided Valley Stream staff with customized professional development and 24/7 technical support. When the NWEA MAP was administered for a second time at the end of the school year, district administrators were thrilled to find that students using eSpark grew an average of 10+ percentile points. 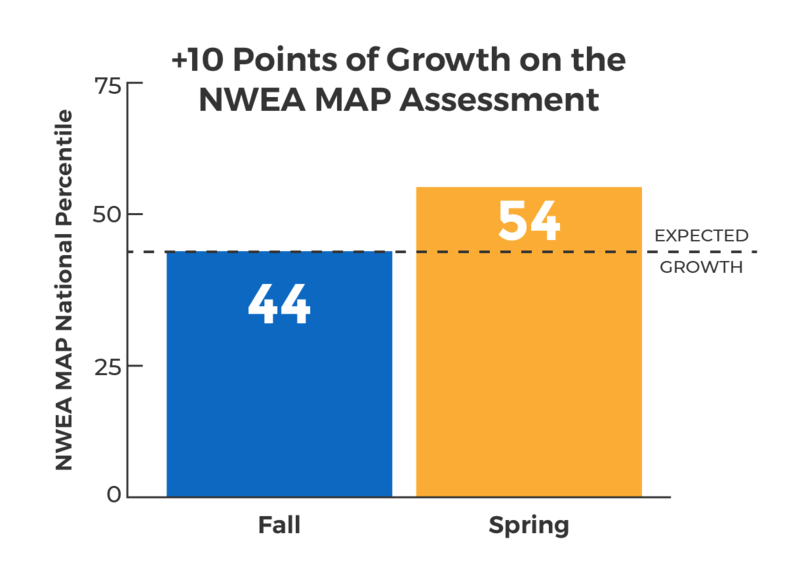 Because the NWEA MAP is a nationally normed assessment, students typically see one to two points of growth over the course of a school year. An average of 10+ points of growth indicates that Valley Stream 30 students are significantly outpacing their peers nationwide. Students who used eSpark grew an average of 10 percentile points on the NWEA MAP, surpassing the national average and outpacing their peers nationwide. Impressed with the high levels of growth students were seeing with eSpark, administrators at Valley Stream have since expanded their districts eSpark implementation to serve over 1,500 K-6 grade special education and general education students in math and ELA classrooms across three school buildings. Over five years since the district first used technology to differentiate instruction, Valley Stream 30’s eSpark implementation is still going strong. During the 2017-2018 school year, students logged into eSpark three times each week to master 12,132 math and ELA standards, about 8 new standards per student. There are 21 New York school districts using eSpark in PK-5 classrooms.